This section allow you to configure and perform automated maintenance tasks. The goal is to easily ensure that your number of deployments doesn't grow more than needed. If enabled, the automated maintenance tasks are automatically performed on your BLT Server every day at 00:00 UTC. You can also run maintenance on demand from this interface. •Auto Cleanup Licenses expired since X days: Check this box to enable automatic cleanup of Licenses that have expired since the number of days you specify (Delay), or more. You can choose to only receive the list by email, or automatically delete those Licenses and receive an email. Note that an email will be sent only if elements are detected. If there is nothing to be cleaned up, no emails are sent. 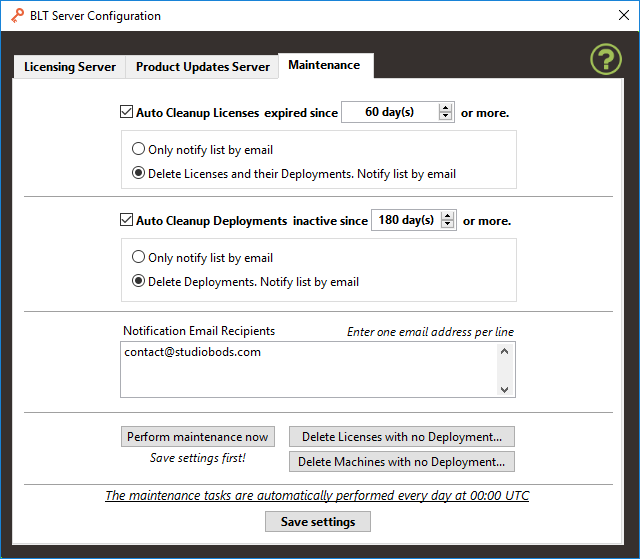 •Auto Cleanup Deployments inactive since X days: Check this box to enable automatic cleanup of Deployments that have not been used since the number of days you specify (Delay), or more. You can choose to only receive the list by email, or automatically delete those Deployments and receive an email. •Notification Email Recipients: Enter the email addresses for people who will receive the email notifications for the above maintenance tasks. •Perform maintenance now: Click this button to perform the configured tasks now. Make sure to Save your changes before clicking this button! •Delete Licenses with no Deployment: Click this button to analyze your server and show a list of Licenses that don't have any Deployment. You will be able to select which Licenses you want to delete or not. •Delete Machines with no Deployment: Click this button to analyze your server and show a list of Machines that don't have any Deployment. You will be able to select which Machines you want to delete or not.